Radley London have created this amazing and beautiful bag for all bag lovers. With 3 main colours this bag is vibrant but cool toned. There is a dark red flap with magnetic closing and a light brown base colour. The handle is a beautiful dark reddish brown. 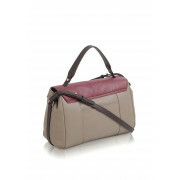 The bag also has an adjustable strap for easy everyday wear. With a roomy interior and a variety of pockets this bag has it all.